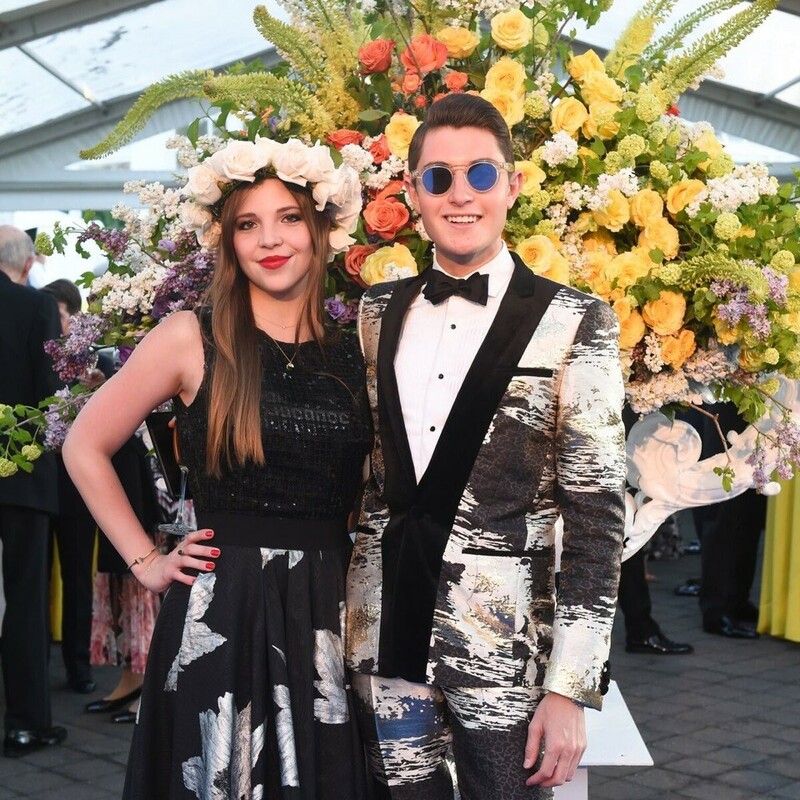 On Thursday, June 1st, The New York Botanical Garden (NYBG) celebrated its annual black-tie Conservatory Ball with Dale Chihuly artwork on display. 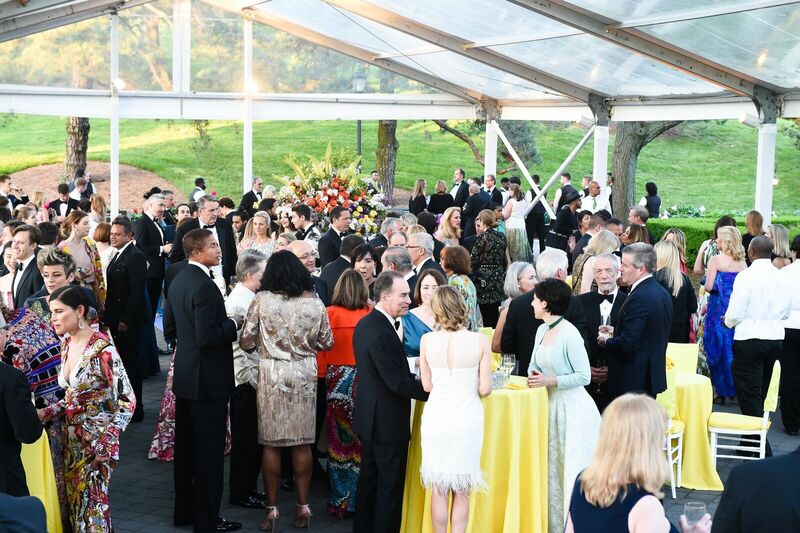 Five hundred guests attended the ball and raised $1.7 million for children’s education and international plant research at the NYBG. Conservatory Ball Chairmen and NYBG leadership greeted guests on a royal blue carpet. The evening started with cocktails at 7:30 pm in the Perennial Garden with music provided by a jazz trio, before moving to dinner and dancing in the Conservatory Tent. On their way to the Conservatory Plaza, guests were greeted by Chihuly’s “Sol del Citrón” sculpture and ushered inside to enjoy the exhibition’s many spectacles within the “Palms of the World” and “Seasonal Exhibition Galleries.” The dinner tent was decorated with vibrant acrylic panels inspired by Chihuly’s new “Koda” studies, which is installed in the Conservatory Courtyard’s Tropical Pool. World-renowned artist Dale Chihuly now has his first major garden exhibition in New York in more than ten years. His exhibition at the NYBG is called “CHIHULY,” which showcases more than 20 installations and includes drawings and early works that reveal the evolution and development of Chihuly’s artistic process during his celebrated career. It opened on April 22, 2017 and runs through October 29, 2017. The NYBG partnered with Northern Trust and received additional support from Verdure/Belperron and Naeem Khan who styled guests such as Genevieve Barker, Linda Fargo, Lisa Harbert, and Suada Velija and Gala Chairmen Alexandra Lebenthal, Gillian Miniter, and Deborah Royce in intricately sequined gowns mirroring the idyllic floral surroundings.